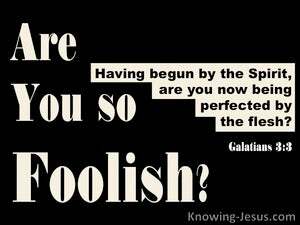 ﻿ Galatians 3:3 Are you so foolish? After beginning with the Spirit, are you now going to be made complete by the flesh? Are you so foolish? Having started out with the Spirit, are you now ending up with the flesh? Are ye so foolish, having begun in Spirit, are ye now made perfect by flesh? Are you so foolish [as to believe that after] having begun [your Christian lives] through [the power of] the Holy Spirit, you can [now] become complete by [living according to your human strength]? Are you so thoughtless? After having begun in Spirit, do you make an end in flesh? Are you so foolish? 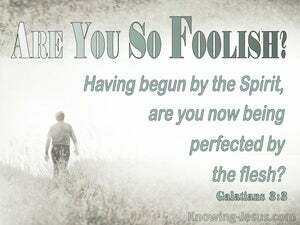 Having begun with the Spirit, are you now being perfected by the flesh? have you so little understanding, as having begun in the spiritual doctrine of the gospel, to turn again to the law? Are you so foolish? having begun in the Spirit, are you now made perfect in the flesh? Are you so senseless? Did you begin with the Spirit only to end now with the flesh? Are ye so thoughtless? Having begun in the Spirit, are ye now made perfect by the flesh? Are ye so foolish? having begun by the Spirit, are ye now made perfect by the flesh? Are ye so unwise? having begun in the Spirit, are ye now completed in the flesh? Are you so foolish? 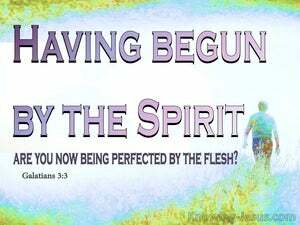 Having begun by the Spirit, are you now trying to be made complete by the flesh? Are you so foolish? Having begun in the Spirit, do you now perfect yourself in the flesh? Are ye so unwise, that after ye have begun in the spirit, ye would now end in the flesh? Are you such fools? Did you begin with the spirit only to end now with the flesh? Are you so without sense? After beginning with the Spirit, will you now end with the flesh? Are you so foolish? Although you began with the Spirit, are you now trying to finish by human effort? Are ye so foolish? Having begun with the Spirit, do ye now end with the flesh? Are you so foolish? Having begun in the Spirit do you now end in the flesh? So thoughtless, are ye? Having made a beginning in Spirit, are ye, now, in flesh, to be made complete? Are ye so senseless? having begun in the Spirit, are ye now made perfect in the flesh? Can you be so foolish? After beginning with what is spiritual, do you now end with what is external? Are you so senseless? Did you begin by the Spirit, but are now approaching perfection by fleshly means? Are ye so foolish? Having begun in the Spirit, are ye now being made perfect in the flesh? Are ye so void of understanding? having begun in the Spirit, are ye now made perfect by the flesh? Justified By The Law, Or Justified By Faith? 2 I only want to learn this from you: Did you receive the Spirit by the works of the law or by hearing with faith? 3 Are you so foolish? After beginning with the Spirit, are you now going to be made complete by the flesh? 4 Did you suffer so much for nothing-if in fact it was for nothing? So you are no longer a slave, but a son; and if a son, then an heir through God. You who are trying to be justified by the law are alienated from Christ; you have fallen from grace! who doesn't become a [priest] based on a legal command concerning physical descent but based on the power of an indestructible life. For a tabernacle was set up; and in the first room, which is called "the holy place," were the lampstand, the table, and the presentation loaves.